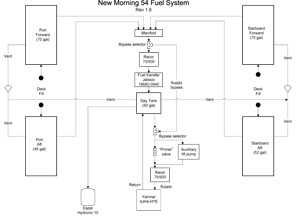 Four storage tanks, and a day tank are the foundation of the fuel system. 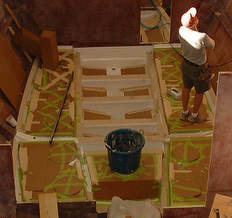 These tanks are built of the 5086 aluminum and reside below the sole, resting on supports bonded to the hull. To port are 70 and 45 gallon tanks and to starboard are 70 and 52 gallon tanks. These tanks feed a 50 gallon day tank, positioned just aft the keel and forward of the engine, creating a total of 287 gallons of fuel storage. Click on the drawing for a full size PDF. 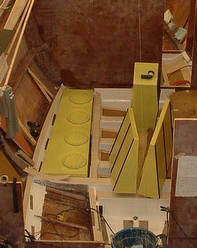 In the picture to the left, you can see the port tank in position, with the other tanks waiting to be placed. A protective coating gives them the lime color. The large circles are removable inspection plates. The picture below shows all five tanks in place, and protected with cardboard. Fuel is pumped to the day tank by a Jabsco fuel pump through a second pair of Racor 75/500 filters. The filters are plumbed in parallel and set to route the fuel through either filter to maximize throughput. The 10 micron filter elements are the first stage of filtering. These filters are rated at 2gpm so at best we transfer 4gpm which means it can take 10-20 minutes for a typical fuel transfer, including a possible change of the manifold valves to switch supply tanks. Since our attention span is not nearly that long, we use an Offshore Systems fuel transfer controller to shutdown the fuel transfer pump when the day tank is 95% full. This protects us from overfilling the day tank and pumping fuel out the vent! From the day tank, fuel is pulled by the engine fuel lift pump through another pair of Racor 75/500 filters, also with 10micron elements. These filters are also plumbed in parallel, but are normally set to route the fuel through only one of the filters. In the event that one filter element becomes clogged a quick flip of the lever routes the fuel through a clean element and should keep the engine running without interruption. The third filter is the engine mounted "secondary" filter which has a 2 micron element. The picture to the right shows the fuel lines into the manifold, the day tank, and to/from the engine. The larger diameter stainless steel pipe in the foreground is the vent line. We also have an auxiliary lift pump in the system which serves several purposes. 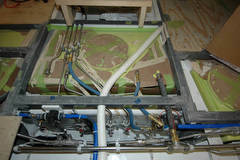 In normal operation it's used to top up the element vessels in the second set of Racor filters when changing elements. This minimizes the amount of air that enters the fuel system and in conjunction with the "self bleeding" Yanmar engine will hopefully mean we never have to bleed the air out of the fuel system. However, in the event that we do have to bleed the engine, this pump can be used to pressurize the fuel system so that we don't have to crank the engine. This avoids the potential problem of cranking the engine for too long and sucking sea water back in through the exhaust system. The final purpose is to feed the engine in the event the engine mounted fuel lift pump fails. The last piece of the system is the day tank bypass. If we're unable to fill the day tank for any reason, the bypass valves will allow the engine fuel lift pump to draw directly from any storage tank. In addition to the main engine, the Espar Hydronic 10 heater, which provides both domestic hot water and space heating, also draws from the day tank. It has its own fuel pump and inline filter.